Today was a day to eat Chili. 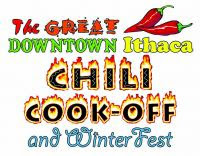 Ithaca celebrated the 11th Annual Great Downtown Chili Cook-off and WinterFest. It was also a great opportunity to promote bikeithaca.org, an effort initiated by Andrejs Ozolins to encourage cycling and other green means of transportation in the Ithaca area. Early in January I made the suggestion to have a table at the Cook-off and soon many more people were involved. The result was great! We had a myriad of information not only for cyclists but also for motorists and the public in general. My main contribution to the table was the article on winter riding. Also on display was information about cyclo-touring, upcoming cycling courses, rides in the Ithaca area, etc. Many people stopped by, including Mayor Peterson, and Andrejs was great at luring people to the table. Brenda Smith, Jennifer Dotson, Mary Bouchard, Robbert van Renesse and Jeff Bateman helped out for a while. Thank you! Two bikes were on display, the Bike Friday "tikit" and the Rivendell Atlantis. The tickit is a folding bicycle intended for commuting. It stold the show today. The Atlantis did not get nearly as much attention. We had many visitors, young and old. In general people were receptive and interested. The stickers and magnets prepared by Andrejs and Steve Powell were a huge success. I was very satisfied with the event and I believe we reached our main goal, which was to let people know about bikeithaca.org. Hopefully the visits to the website will increase significantly. Below are some of the pictures I took.